Diversity & Inclusion offers more than just a colourful collection of topics. A value-added process with which diversity systematically becomes an advantage for your company and your stakeholders through conscious appreciation and active involvement. However, the critics of diversity see the potential conflict that diversity can hold. Smart managers, on the other side, clearly see the potential of different strengths and perspectives, and they consistently pursue these benefits. Our Propelling Performance Principle ensures that your D&I value creation process will succeed. 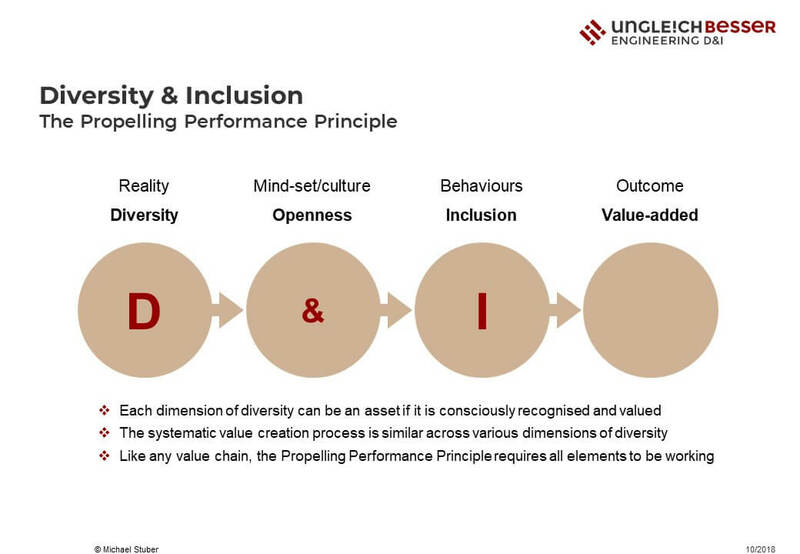 Even if legal regulations can suggest this: Diversity is not the goal of the Propelling Performance Principle for ’Diversity & Inclusion’, but the starting point. Even the alleged ideals of being colour-blind, treating everyone equally or putting them on an equal footing are not economically viable. To develop individual strengths, companies must be aware of differences – and similarities – and sometimes even emphasize them. At first, it was common sense, then it became proven certainty: diversity can only be developed as a potential with a respectful, open-minded attitude. Openness should be encouraged at several levels: As an individual mind-set, as a team culture and as a value of the corporate culture and especially the leadership culture. Nevertheless: With open-mindedness alone, your company does not generate added value from diversity. Similar to other areas, also in D&I the actual, tangible benefits are created on the behavioural level. Only the concrete involvement of different people through collaboration and in operational processes as well as a meritocratic people management generate the added value that drives diversity management in your company. In this context, Inclusion describes a collaborative and integrative behaviour (and not a mental attitude) based on partnership, and it does not represent a subsequent phase or alternative to diversity. The value chain also shows that active design – and thus focused efforts – are required to achieve these results.